Nike, CarMax, and Winnebago are set to post earnings results over the next few trading days. Investors couldn't shake off fears of a global growth slowdown last week as they sent both the S&P 500 (SNPINDEX:^GSPC) and the Dow Jones Industrial Average (DJINDICES:^DJI) down by more than 1%. 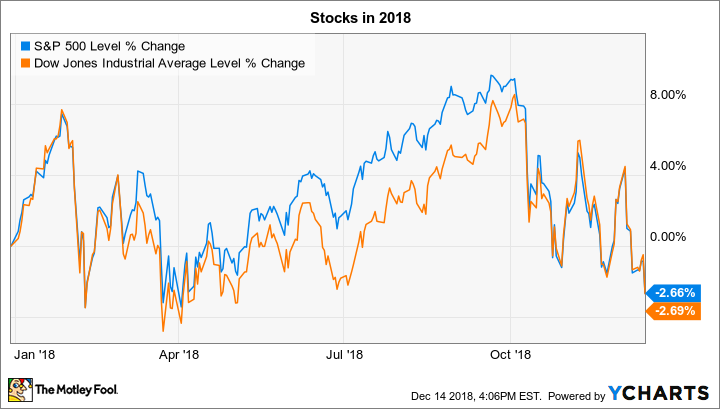 With just a few trading days left in the year, indexes are lower by 3%, or about twelve percentage points off from the highs they set in early October. The week ahead might again be dominated over worries about a potential global growth slowdown. But a few stocks stand ready to move based on company-specific earnings news. Let's look at what investors should expect to see from Winnebago (NYSE:WGO), Nike (NYSE:NKE), and CarMax (NYSE:KMX) in the trading week ahead. Winnebago investors aren't expecting much good news from the recreational vehicle specialist when it reports earnings for the first quarter of its new fiscal year on Wednesday. The company's fiscal 2018 was an impressive financial outing, with sales, profitability, and market share all increasing thanks to its big push into the towable product niche. However, the RV industry's nine-year expansion streak appears set to end, and that outlook has contributed to a rough run for the company's shareholders lately. Winnebago's profits are also likely to be pinched by rising costs for inputs like aluminum and steel due to world trade skirmishes. CEO Michael Happe and his executive team cautioned in October that the next few quarterly reports might show sluggish growth even as tariffs boost manufacturing costs. Winnebago still sees a path toward continued market-share gains via innovative product releases that appeal to consumers looking to experiment with the RV lifestyle. Nike announces its results after the market closes on Thursday in a report that should show steady progress in its global growth rebound. Sales gains accelerated in the key U.S. market last quarter, jumping to a 6% growth rate from 3% in the prior quarter as the footwear and apparel giant flooded the market with newly released products. These launches, combined with a lower inventory position in the broader industry, helped gross profit margin begin marching higher after declining for more than a year. Investors will be looking for those positive sales and profitability trends to continue into Nike's fiscal second quarter. But any big movement in the stock this week will likely be driven by updates to the company's outlook. As of late September, the company anticipated that sales would rise by nearly 10% in fiscal 2019 to mark an acceleration over last year's 6% expansion. Gross profit margin should also improve for the first time since fiscal 2016. If Nike reports a strong outing at the start of the peak holiday shopping period, it may find room to affirm or even upgrade that forecast. Used-automobile retailer CarMax reports earnings on Friday. Operating trends have been mixed lately, with comparable-store sales improving for the second straight quarter last quarter to reach 2%. However, CarMax is still struggling with declining customer traffic and soft pricing trends. Meanwhile, advertising spending and the chain's aggressive investments in its online sales channel have pushed bottom-line profitability lower. On Friday investors will find out whether pricing trends in the industry have started to improve as management has previously predicted would occur. They'll also be watching closely for any signs of another downtick in volume trends. Finally, CEO Bill Nash is likely to update shareholders on the early results of the company's trial program that has moved the entire car-buying experience online. For now, that initiative is only available in the Atlanta market. But CarMax is hoping to scale it up nationally if it finds enough consumer demand.